If your frenum is the right size and properly positioned on your gum line above your two front teeth, it serves the simple purpose of attaching your gums to your lip, and all is well. Your frenum is supposed to move upward when your baby teeth come in to make room. However, if the frenum is too large, attached in the wrong spot or fails to move down like it should, it can cause problems. An incorrectly placed frenum can exert a pull or tension that prevents your front teeth from coming together the way they should. What makes this even more of an issue is the fact that braces can’t fix it! With the frenum in the way, your front teeth will never get to meet one another. Fortunately, there is a way to solve the problem. 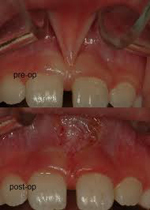 There is a procedure known as a frenectomy, which is just a fancy word for reducing the size of your frenum. This limits the tension that keeps your teeth apart, and opens the door for braces to be placed to bring them back together in the right position. It is a very simple procedure performed by your orthodontist or dentist in the office. Your dentist just numbs your gums, removes a tiny bit of the frenum, and you are on your way. Now that lasers are often used for this surgery, it makes the whole thing even easier. There will be a few days of soreness afterwards while your tissue heals, but it is a small price to pay for bringing your front teeth together. After all, they make such a good pair; it’s a shame for them to be so far apart! Sometimes however, front teeth are kept apart because of a jaw discrepancy where the lower jaw is bigger than the upper jaw causing the front teeth to spread apart. This is a problem of a completely different nature. If you or someone in your family has a space between their two front teeth that want to eliminate, Chadwell Orthodontics will be able to evaluate the problem and determine the best course of treatment to close the space. It may be much easier than you think.